Chain ID, which is a joint blockchain authentication of financial investment industry, will be applied to Samsung Electronics’ Smartphones as a basic function. 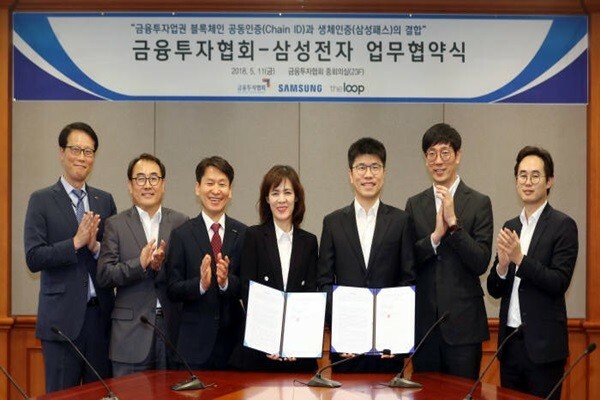 Korea Financial Investment Association (KOFIA) exchanged a MOU (Memorandum of Understanding) with Samsung Electronics to combine Samsung Pass with Chain ID. Chain ID is the world’s first blockchain-based joint authentication system that had 11 financial investment companies join last year for online stock trading and funds transfer. Financial investment industry is expecting that combination of Chain ID and Samsung Pass will greatly increase accessibility of stock trading through Smartphones for investors. Samsung Electronics’ Smartphone users can use Chain ID without installing a separate application. Samsung Pass is an authentication technology that utilizes biometrics such as fingerprint or iris.